During May and June there will be Performance Training for U13 - U17 boys and girls. This will be held at the University on May 7th, 9th, 14th, 16th, 21st, 28th. June 4th, 11th, 18th, 25th. All session 6.00pm - 8.00pm. 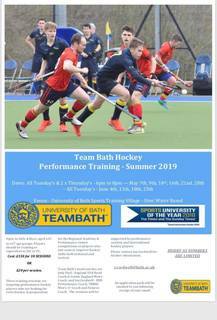 This is open to those who are training at or equivalent to England Hockey's Academy Centre or Performance Centre.